“Be prepared to do a lot of listening”. I’ve gotten this line of advice from every friend, colleague, and mentor who has heard about my work this summer mapping the social, political, and economic context behind the effort to study and conserve the longest big game migration in the lower 48. This reminder of the need for humility was always welcome, but by the time I touched down in Laramie, I had also begun to realize that it was incomplete. Although every peer and advisor had emphasized the importance of listening, all had assumed that I knew best what questions to ask and what outcomes to work towards. The thing about humility in qualitative research is that it begins well before the interview, in acknowledging that the researcher may not even know what is worth listening to, or reporting on. When I charted my field season from the confines of a snug library during the slushy New Haven spring, I had planned to leap immediately into formal, recorded interviews for data collection. 10 weeks is not a lot of time to collect a solid sample of hour-long conversations with individuals scattered across all of western Wyoming. This holds especially true because for my project, because no official list of potential interviewees impacted by the Red Desert to Hoback migration exists. In such cases, a researcher must instead rely on the “snowball effect” to gain access to an increasingly broad community of suitable participants through word-of-mouth networking. With the clock ticking, I was anxious about giving up a week of data collection. But, in the spirit of truly listening, I decided to go off-script. For my first week in the West, I met with key informants—folks who already knew something about my project and were interested in seeing it develop—in each of the participant communities I am focusing on: ranchers and landowners, NGO staff and board members, hunters, scientists, energy professionals, and state and federal managers. In each meeting, I asked a simple question: “how can I make sure this project produces something useful to you”? The diversity of answers was remarkable, and taking them in was an exercise in humility itself. Feedback ranged from a frank and concise “you can’t… just focus on learning for yourself”, to a contemplative encouragement to focus on the human stories behind the policy positions I uncover, to a passionate and forceful assertion that a project like mine is only worthwhile if it helps unify people around their common interests. Across the board, responses carried perspectives and kernels of wisdom that my carefully-compiled series of questioning on stakeholder values and problem definition would never have uncovered. And across the board, they helped me prepare to use the rest of the field season to gather data that is not only academically interesting, but politically and socially relevant to the people on the ground who live and work in the path of the Red Desert to Hoback migration. 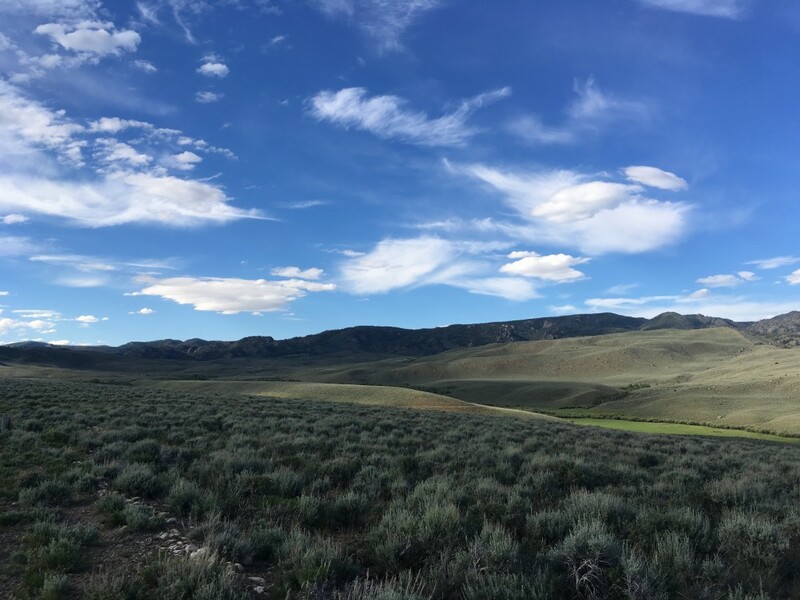 My research is taking me across the sage-brush landscape that the Sublette County mule deer herd calls home. There is something wonderful in sharing a landscape and route of travel with the deer who’s migration is behind the policy challenges I’m seeking to understand. 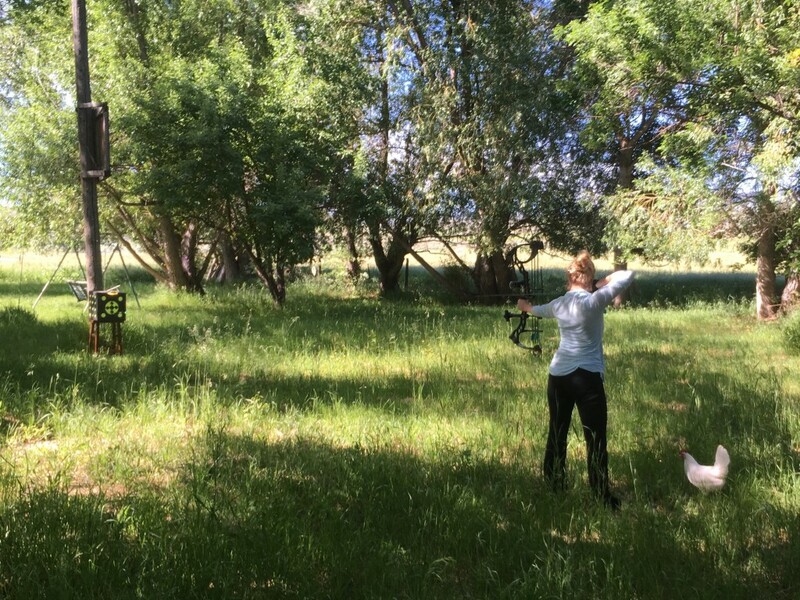 I had the pleasure of joining one of my key contacts in the sporting community for archery practice, after a day of scouting the rugged terrain where she will hunt this fall. Although the season is a long way off, sportswomen and sportsmen (and their chickens!) are already getting back into shape with their weapons, scoping out the landscape for promising spots, and keeping tabs on movements of trophy deer.